Your local “off leash” park is a great place to take your dog to give it a chance to socialize. It is never a good idea to use it as a substitute for taking a walk with your dog. Before you take your dog to a dog park you need to think about what you are about to do. Taking an excited or anxious dog to the “off leash” area with other excited or anxious is just asking for a fight. 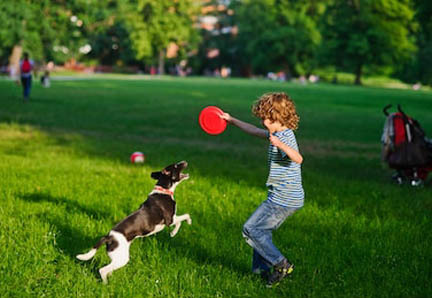 The “Off Leash” park is a pleasant experience for you and your dog. Just remember to follows a few basic rules. Your dog must to be completely calm and totally under your control before you enter the park. Also, your dog must respond to your voice commands each and every time. If not you probably need to re-think going. At least until your dog can be in your complete control of leash. Never socialize a sick dog in a public environment. You MUST make sure that your dog has a clean bill of health. If your dog has skin problems, parasites or any other sickness it may expose a lot of healthy dogs to it. Your “off leash” park experience will be a great one for you, your dog and everyone else at the park if you know the information below. Upon arrival, make sure that your dog is completely calm before you go through the gate of the park. If it takes a few minutes for your dog to achieve a calm state of mind, so be it. Take all of the time you need!!! If you enter too soon, the next thing you do might be breaking up a fight. Make sure you keep your dog in sight and under voice control at all times after entering the park. While in the park watch for any excited or out of control dogs that might be in the park. Avoid them at all cost. Remember, not everyone at the dog park has read this list. You are responsible to clean up after your dog and dispose of anything left by your dog. The best and quickest way to do this is to carry a zip-lock baggie or two in your pocket so that they will be handy if you need it. Your dog must be vaccinated and have all shoots up to date before you take your dog to an “off leash” park in most cities. Some areas require you to have your dog licensed or pay a user fee before you can access the park. If your dog starts to become unruly or plays rough, correct this behavior at once. If it continues to be unruly, put the leash back on the dog and leave the park until it becomes calm again. Remember, owners are responsible and liable for the actions and behavior of their dogs at all times when in public. While you are there it is OK for you to do some socializing too. But your main focus is to pay attention to your dog at all times. You need to be able to respond to your dog’s needs or actions at a seconds notice. It is always best that all dogs at the dog park be supervised by an adult. If a dog is brought into the park by a child, a parent or guardian should always be present.NOTE: In most areas Children 8 years and under are not allowed in the off-leash dog area. Children ages 9 – 15 years must be accompanied by an adult. Keep your dog within the designated Off-Leash Area’s boundaries. Once you leave the area, be sure to replace the leash. In most cases, all other city, county or state park rules apply to “off leash” parks. It is important that you know the park rules before you go in.